Road Condition: Rocky dirt road. 2WD accessible but requires good clearance. 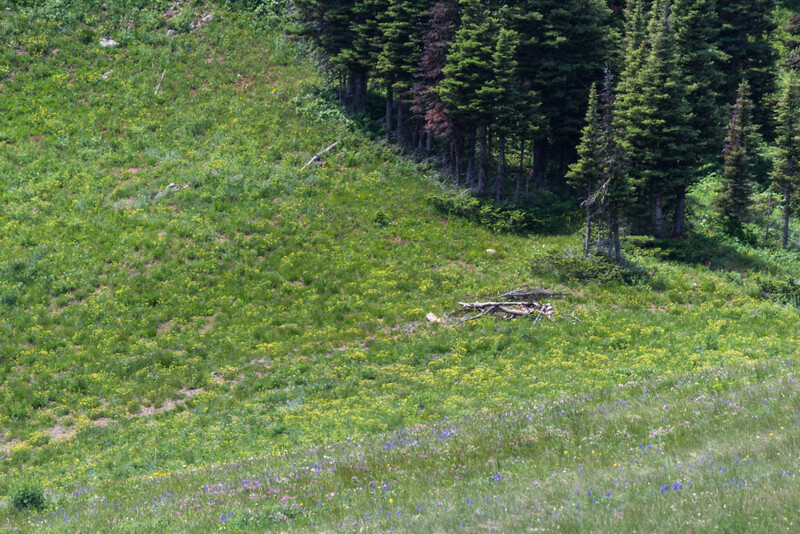 Campsite Availability: Well-established site just west of the pass. 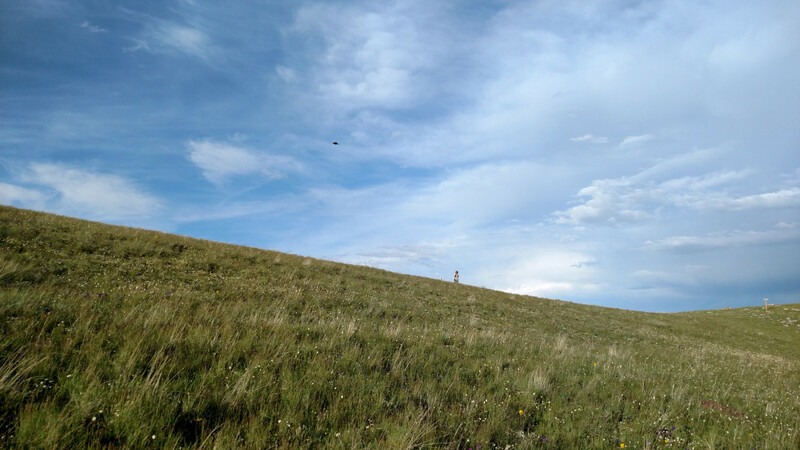 Trail Condition: Well defined and maintained but rocky in some parts. Water Sources: Few small creeks, probably intermittent. Weather: Partly cloudy. 70's. Some rain. Side Quests: Rock spire just west of the pass. Ross Peak. 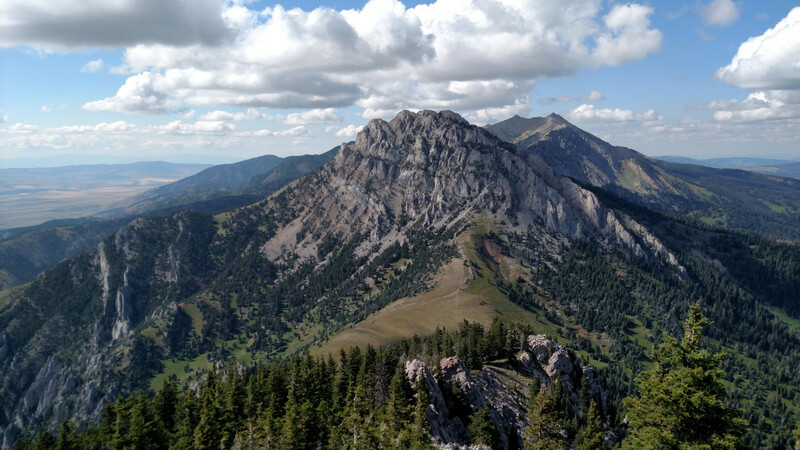 Ross Pass is a broad, easily recognizable saddle that marks the halfway point between the northern and southern ends of the Bridger Range. The simplest approach is from the Middle Fork Brackett trailhead on the east side of the range. 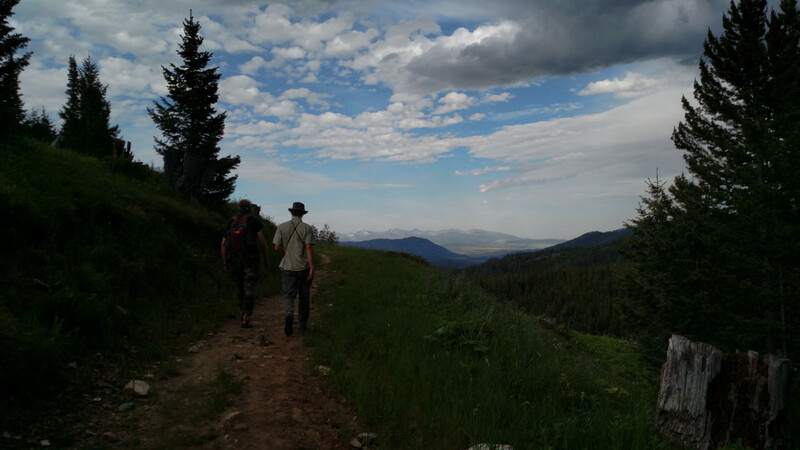 It’s an easy trail with minimal elevation gain and exceptional views making it perfect for an evening or half-day hike. 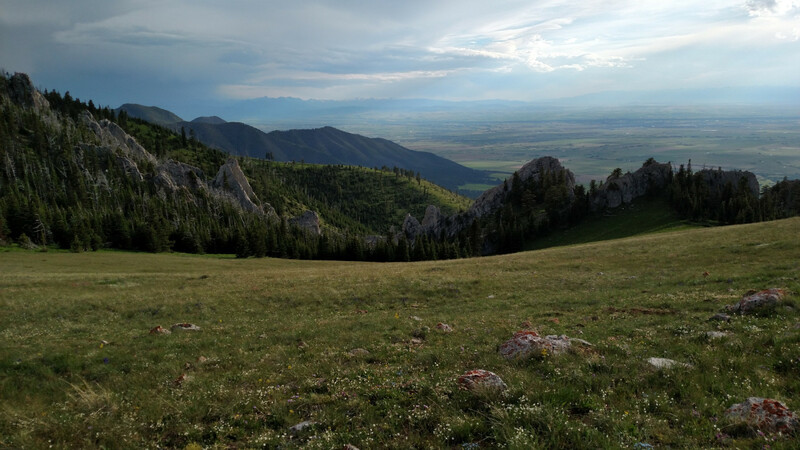 One could spend hours relaxing on the saddle, which is lush with grasses and wildflowers, or exploring the surrounding terrain which includes Ross Peak, the gnarliest peak in the Bridgers and popular climbing spot for locals. 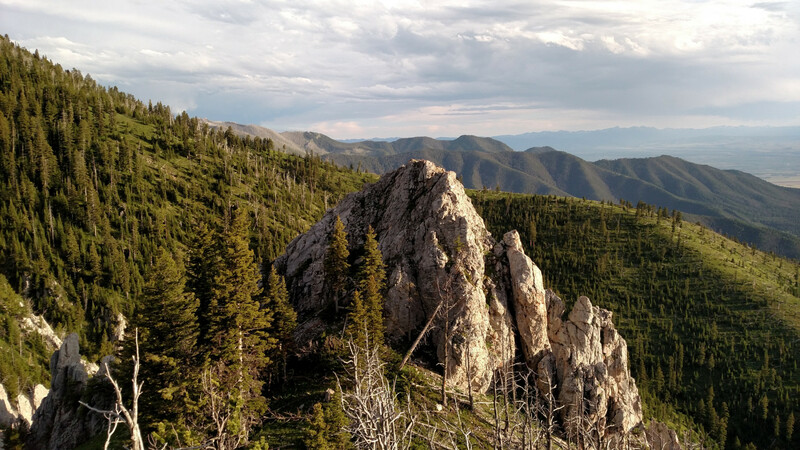 The peak towers an additional 1400′ above the saddle to the north and the up-close views are truly awe-inspiring. Ross Pass. Photo Taken December 2015. For about four months now weekly adventures into the wilderness had taken me to a variety of places I never thought I’d go. It had become an addiction and the addiction needed to be fueled. But many of the short hikes I wanted to do had been put on the back burner since weekends were typically reserved for day-long excursions. 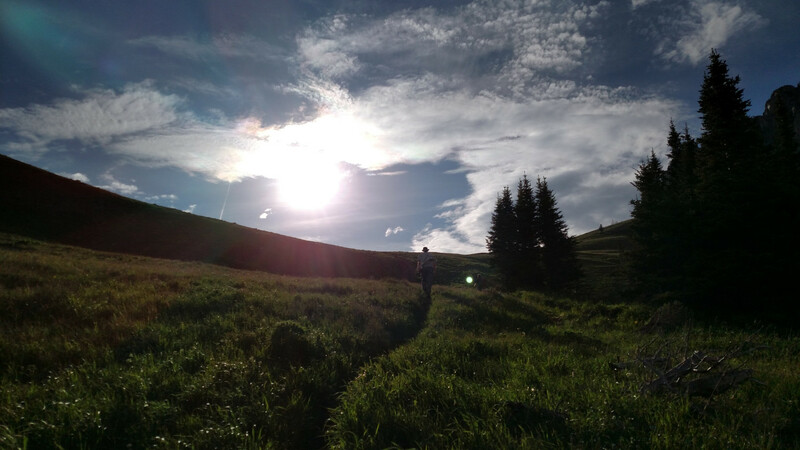 One hike a week simply wasn’t going to cut it so I proposed to my fellow adventurers that we hit the trails a bit harder and try to incorporate an additional weeknight hike into our busy schedules. 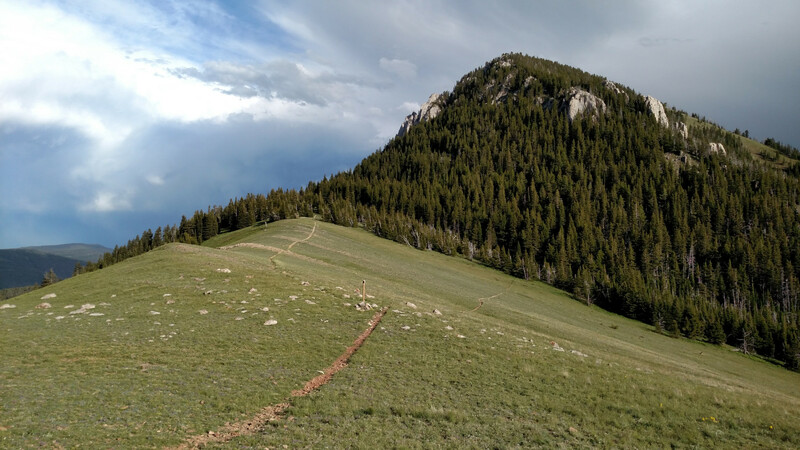 My proposition was met with unanimous approval and our first destination in a series of weeknight hikes was chosen to be Ross Pass, a distinct low-lying saddle halfway down the Bridger Ridge. 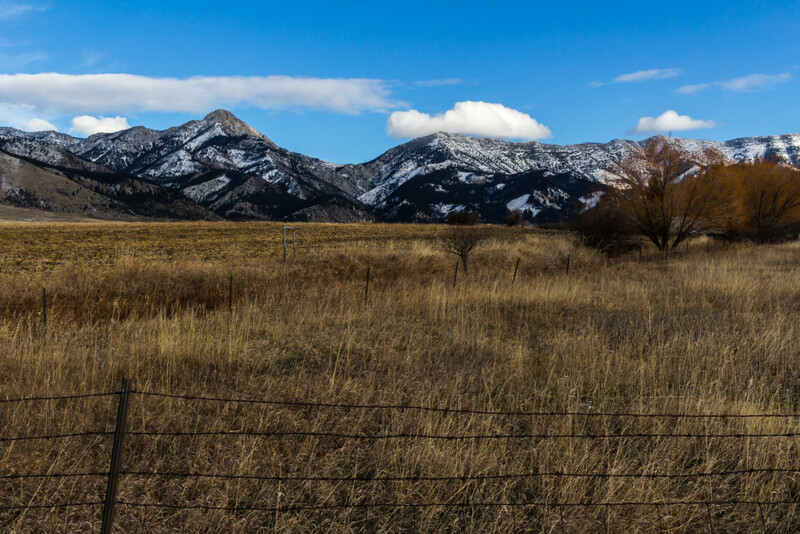 Ross Peak, the gnarliest peak in the Bridger Range, lies directly north of the saddle. Although only the fourth tallest peak in the range it’s by far the most prominent and I was eager to get an up-close view since it appears completely different from every angle. 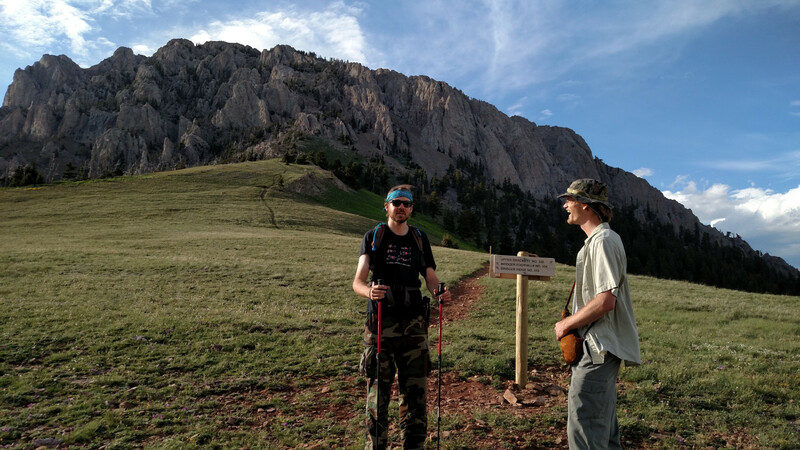 Ross Pass can be accessed from several angles but the eastern approach from the Middle Fork Brackett trail head is the simplest and shortest with only 1000′ elevation gain over 2.3 miles. A gate prevents access to the trail head from 12/2-6/15 so the more strenuous western approach via Truman Gulch is more appropriate for early springtime travel. The Jones Creek Trail would provide a shorter, year long approach from the west but private property, it seems, inhibits access. Further inquiry is necessary to verify if this approach is a viable option. The giant arc of Ross Pass makes its first appearance along Bridger Canyon Road just past the turnoff for Bridger Bowl Ski Area. A few miles beyond, a well maintained dirt road leads west towards the trailhead at the intersection of Brackett Creek Road. There’s a gate at the start of the road without any open/close dates posted. (I assume it closes whenever the snow makes car travel impossible and opens whenever the snow melts out). At about 3 miles in there’s a parking lot for the South Fork Brackett trailhead. 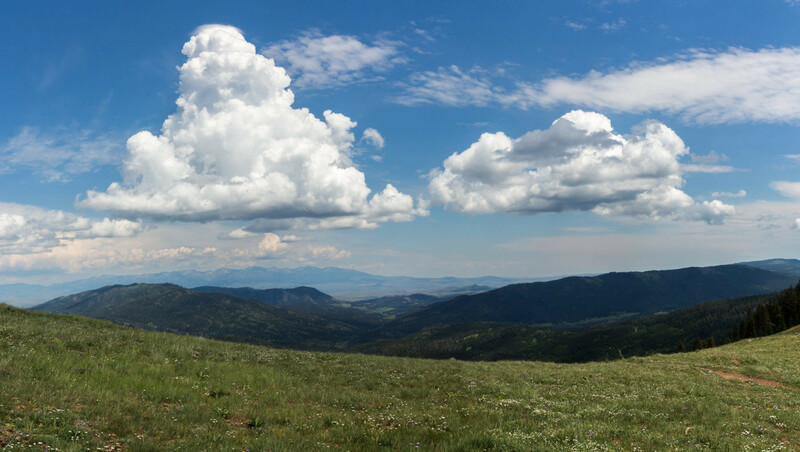 The remaining 2.5 miles to the trailhead for Ross Pass is a rugged dirt road which is open from 6/16-12/1. A high-clearance vehicle is recommend for this stretch. The road seems to melt out much earlier than the opening date so one could easily bike the remaining distance to the trailhead from the gate. The parking lot at the Middle Fork Brackett trailhead is tiny. Only a handful of cars can fit but we were once again the only hikers around so parking was not a problem. The trailhead. Ross Peak on the left. Photo taken June 2016. There’s really not too much to say about the trail itself. It starts out mostly flat and rocky, leading through a lightly forested area, and gradually gets steeper as you approach the pass. The trail is appropriate for advanced mountain biking and does allow some forms of motorized travel as well (we saw dirt bikers on the way back). There’s only one intermittent stream crossing so I wouldn’t count on a reliable source of water, especially in the summer. Enjoying a casual walk through the woods. Crazy Mountains in the background. The terrain was like child’s play compared to our previous adventures so it was nice to go on a relaxing stroll through the woods for once. Scattered showers were in the forecast and sure enough a minor squall hit about halfway in. It wasn’t enough to hinder progress and it left behind a beautiful double rainbow. Ascending the pass was like climbing the stairway to heaven. The forest had opened up into a gorgeous meadow dotted with wildflowers and the sun shone down, blinding me from the path ahead. I lagged right behind Christian who was now just a silhouette against the intense light. It was a simple climb and in no time we made it to the top of the pass. Following Christian up the stairway to heaven. At the saddle the trail intersects the Bridger Foothills trail which heads north-south along the west side of the ridge. Just south of the intersection the Bridger Ridge trail splits off heading straight up the ridge. The Upper Brackett Trail No. 528 heads north towards the right side of Ross Peak, which towers an additional 1400′ above the pass. It was incredible to finally see this immense chunk of rock up close. 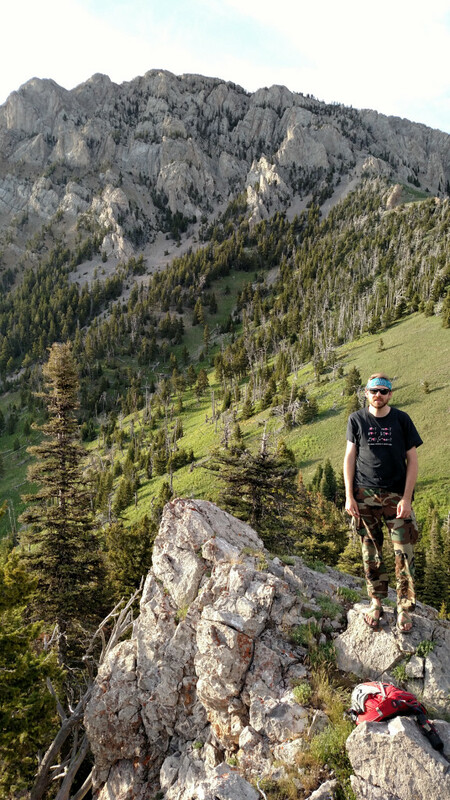 I’m unaware of any non-technincal route to the summit but I’d love to come back some day and see how far up I can get before succumbing to defeat. My brief evaluation of the peak suggests the eastern approach to be a good place to start. The top of the pass. Apparently something was just hilarious. Ross Peak in the background. The right side looks like the most viable route to the top. 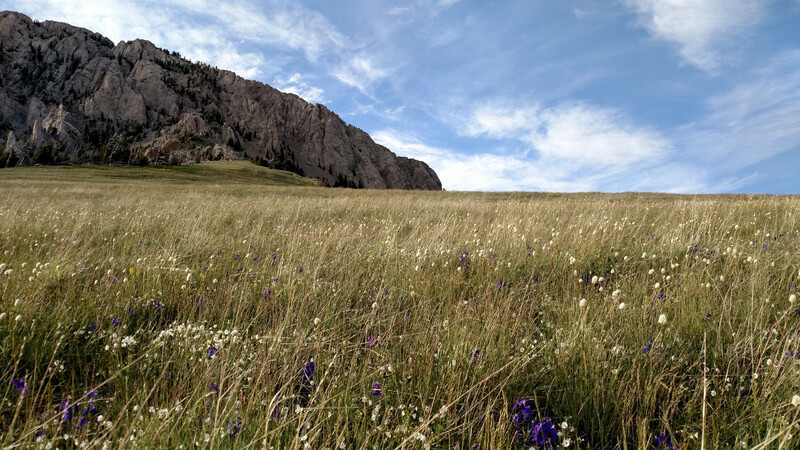 Ross Pass is the perfect place to just hang out and relax. 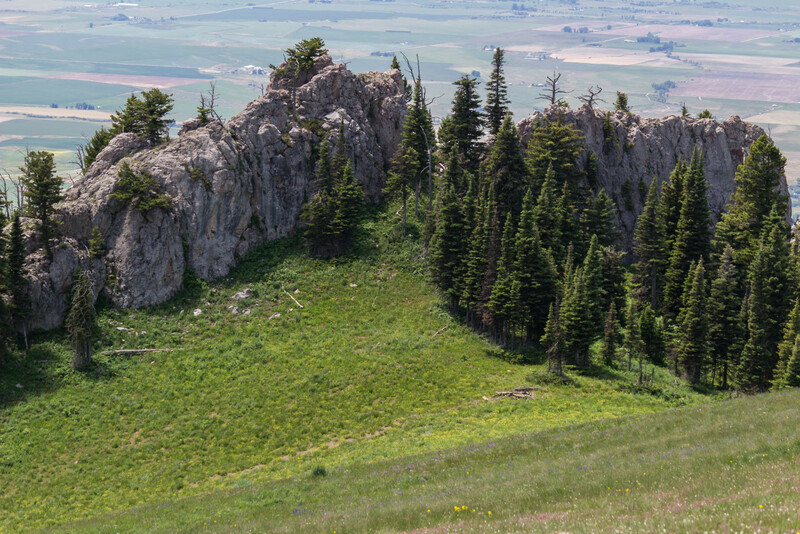 The beautiful grasses and wildflowers of the saddle are neatly juxtaposed with the sharp pinnacles of Ross Peak making for a very picturesque scene and the view of the Gallatin Valley to the west is excellent. Looking east from Ross Pass. Photo taken June 2016. We weren’t at the pass for long before a pesky crow started cawing at us from deep within the woods. In a pathetic attempt to establish communication Christian tore a blade of grass from the ground, put it to his mouth, and began projecting his own “bird” calls in the direction of the cawing. For a moment we were actually convinced we’d successfully opened a channel of communication with the crow; every time Christian gave out a call it seemed caw back at us. After some time, though, it became obvious that the crow was cawing sporadically on its own so, fed up with the crows nonsense (and slightly humiliated), we headed down the west flank of the pass towards a rock spire a short ways below. We came across a fairly well-established campsite with a fire pit at the base of the spire. The location of the site is great but there’s no water sources nearby so you’d have to camp while there’s still snow on the ground or haul up your own water. View of Bozeman and the Gallatin Valley. The spire and campsite are to the right. Closeup of campsite. Photo taken June 2016. It was an easy scramble up the spire and we hung out there for a while chucking rocks over the edge. The first tick I found on me in Montana was at the top of this spire. It was common to encounter these bloodsucking nuisances in the woods of Wisconsin so I learned to tolerate them at an early age and felt much pleasure as I fearlessly dismembered it with the sharp blade of my Leatherman. View of Ross Peak from the top of the rock spire. The sun was getting pretty low in the horizon by this point so we descended the spire, climbed back up to the top of the saddle, and enjoyed a beautiful sunset on the way down to the parking lot. Even though Ross Pass is an extremely short hike it’s still a lot to do in an evening especially if you hang out at the pass for a while like we did. 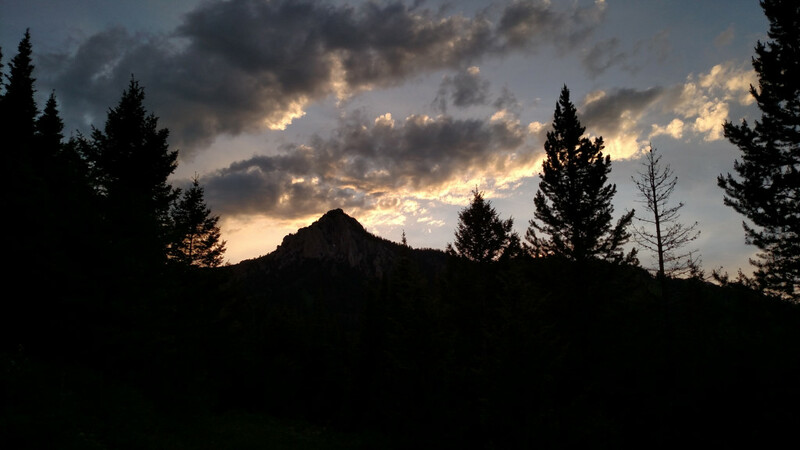 Ross Peak against the sunset.